A friend of mine had a very interesting question for me yesterday. He asked, “Would you still be blogging everyday if you were married?” My reaction at that moment was yes, probably, but the process might look a little different. I might just be blogging random stories, and would not have made the 25 day Christmas commitment. I walked away and didn’t think much about it. Yesterday was busy, at work in the morning, then a photo shoot scheduled for the afternoon and more work in the evening. My Sunday afternoon photo shoots usually consist of driving to small towns and looking for abandoned houses with a group of people. Yesterday, I photographed a band called Moving Colors. They rock the house everywhere they play and I really enjoyed doing the shoot. We did some silhouettes behind the big screen, what a blast! After I left the shoot, I had to run to the bookstore to find some Luke 2 images for a video. As I was on my way there, having a small amount of time for personal reflection, I couldn’t help thinking about the question again. Why did he ask that? Curiosity got the best of me, I had to email him and find out. I typed it at a stoplight, not while driving… just for the record. I went to dinner with a friend, one whom needed a break as badly as I did, and had some nice ‘down time’. Through the course of our conversation, it was apparent to me that nobody gets enough personal time or down time, especially during the Christmas season. I don’t think this is necessarily a bad thing, but certainly there has to be some holiday balance. Where? I have no idea. 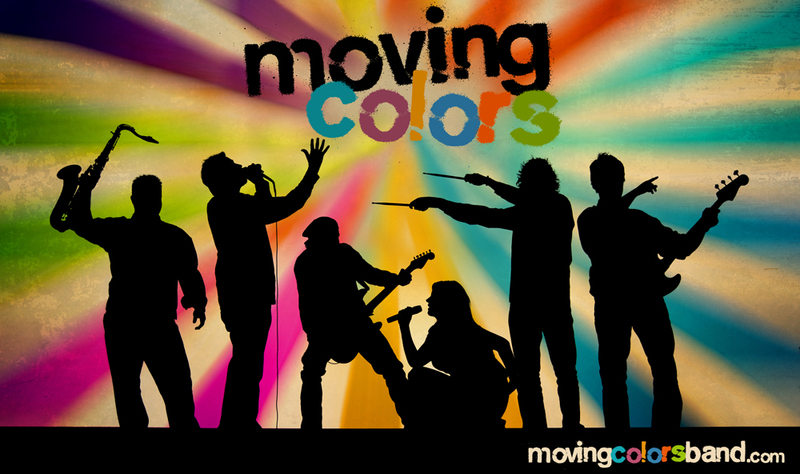 I’m intrigued by the name Moving Colors. I forgot to ask how they came up with the name. As I look at it, it’s very descriptive of the way I see things in my world. Life moves so quickly, it sometimes looks like a blur of colors in a time-lapse video. The name is obviously based on their incredible talent and I’m quite sure, has nothing to do with a fast paced life. I received a reply to my email, “…when you are married one tends to process life issues out loud with their spouse. Since you don’t have one right now you seem to be processing life in your blogs.” I had never really thought about it that way. Hmm. More food for thought. Trying to live this Christmas more outside myself has been an extraordinary experience. Spending time doing things for others, not for myself, is just an awe-inspiring way to spend time. I plan to do this well into next year, not stopping after the Christmas season. As Jim Johnson said in his message yesterday about living upside-down, we tend to forget the changes we have made to live differently and go back to the same daily grind. Next year at this time, we’ll start the whole process over again. Jim suggested we leave a Christmas item out of storage this year to remind us of our promised change. Being the weird artist type that I am, I already do that, so I’ll have to choose something different that my usual Christmas lights. Maybe an ornament. One for me and one for each of my kids. To answer the blogging question, honestly, I really don’t know what would be different. I don’t really have a definite answer. I might be blogging, I might not. Blogging might be a substitute for adult conversation and relationships. It might be a daily cure for loneliness. It might be just for fun. It might be my down time. It might be a place for me to express my humorous and complex viewpoints on life. Whatever it is, God is involved in it. Maybe I don’t need to leave anything out of the Christmas box. My blog might be the thing I need to remember the changes I have made. I suppose I should read my blog every so often throughout the year so the tinselectomy changes don’t fade away. Whatever. I can’t count! Leave it to me to try and change the birthdate of Jesus. Okay, math has never been my thing. I’m focusing more on the artistic process here, not the time, or time-math. Work with me people. Only one person has been brave enough to point this out, and as soon as he gets out of the hospital, you can ask him about it. Have you read The Five Love Languages? I have, and although I may not know my love language, I know what it’s not. It’s not gifts. With that being said, please enjoy my 2009 Christmas gift giving guide. Your most memorable childhood gift. 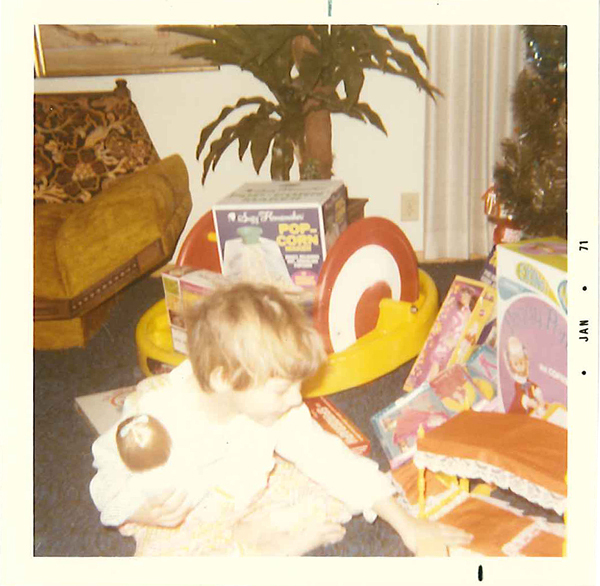 What was the coolest, most mind-blowing gift you received as a child? No silly, besides the box it came in? Mine was a Krazy Kar. It’s that bright yellow thing with the swirly peppermint wheels. I don’t recall how long I had it, but I know it was several years. I’m guessing it was completely worn out, not suitable for anything but plastic recycling, as I loved it to death. I had no idea what this was called until last week when I posted this photo on Facebook. Product description: The Krazy Kar is as equally wild as it is wacky! Drive it forwards, backwards, or in circles for indoor and outdoor fun all year long! Features giant 3′ action ride-on and big 18″ wheels. Made with safe, rugged, durable construction and holds up to 70 lbs. Colors may vary. Adult assembly required. 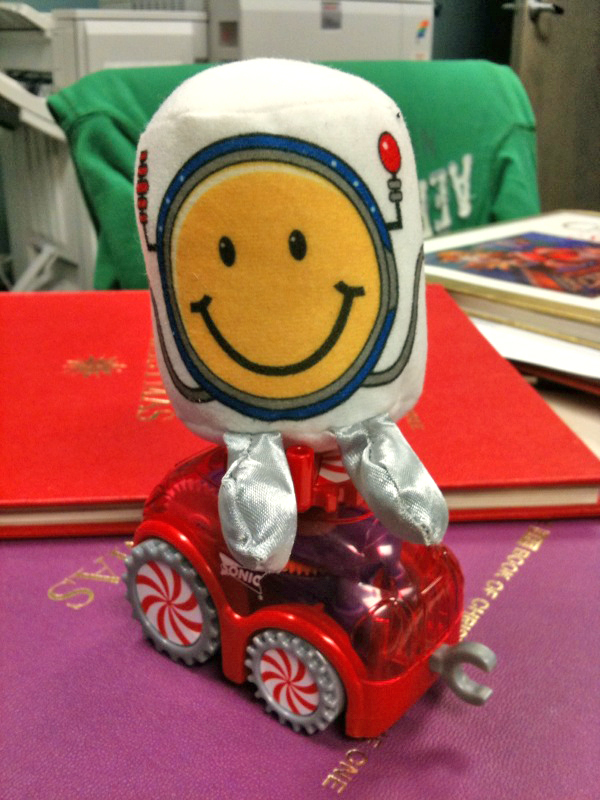 Although I like the new edition of the lightening bolts, I’m a little saddened that the swirly peppermint wheels are gone. Oh well, nothing a little paint can’t take care of. And 70 pounds? How am I supposed to show my kids how to ride this if I can’t? Their Green Machines hold up to 180 pounds, not that I ever take advantage of that. But hypothetically speaking, let’s say you want something like this so you can ride it too. 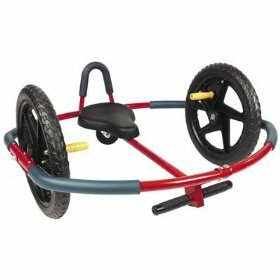 Product description: Kids use their hands to power this innovative twist on the conventional ride-on. Lightweight construction helps riders cruise right along, safely take corners, and spin 360s on almost any surface. Features a steel frame, rubber tires and a padded seat for riders up to 110 lbs. 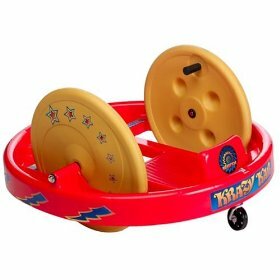 Okay, so I don’t weigh 110, wishful thinking, but I’l only a bit over it, so technically… Also, if you buy one of these for your kids and they choose to keep spinning in circles, keep them outside for a little while before bringing them in the house. Is your favorite toy still available? Creative, memorable and just downright awesome. What is the most meaningful or creative gift you have ever received? The most creative for me was a bouquet of paintbrushes. I’m not a flower kind of girl, and this gift giver, although knowing me for a short period time, gave me a meaningful gift. I was married for eight years and the man still gave me flowers when he was in the dog house. That made me angry, spending a crazy amount of money on something that’s dead upon arrival and will look like it in three days. I cannot comprehend this. Product description: NEW!!! One pair of s-c-a-r-y, b-o-n-y flamingoes! For All Occacsions: Halloween, Over-The-Hill Parties, Special Birthdays, Block Parties, Special Occasions, Retirement Parties etc. Can be used indoors or outdoors. “Perfect for the party…then in the yard for the rememberance!” When assembled they stand approximately 34″ high. Made in the U.S.A. of HDPE plastic. Red fish, blue fish, old fish, new fish. Dr. Seuss might be on to something here. Why do we feel like gifts must be something new? What’s wrong with old stuff? Anyone can go into the cookie cutter stores, purchase mass produced material goods (available in many colors and styles), take the stuff home, wrap it in a bunch of fancy mass produced paper and call it a day. Thought process? 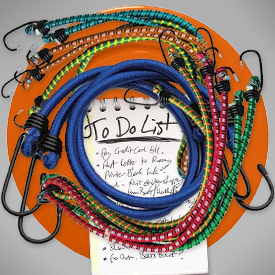 “I’ve made my expected purchases, checked it off the to-do list and I’m on to my other busyness.” What has been accomplished here? We’re supporting financial insanity and overseas sweatshops. Now don’t get me wrong. We need people to buy lots of new stuff, because without that, there would be nothing at the thrift stores. I would not have found my $1,300 grill for $70 or my son’s $595 Sleep Number bed for $6. Okay, I’m being sarcastic, but seriously, if you are supporting thrift stores with your old stuff, please continue! 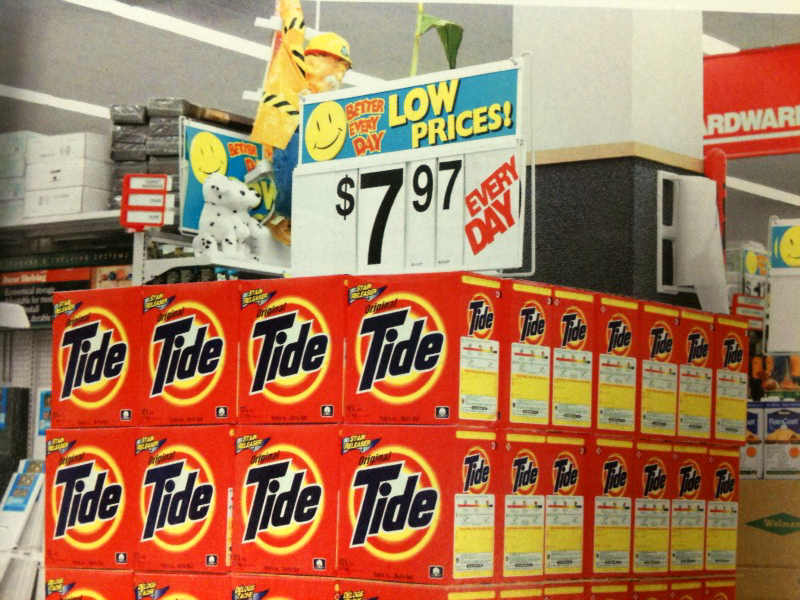 These stores raise money to help needy people, so why not go treasure hunting? It’s three times better! You are saving money, you’re supporting people in need and you’re spending the time to look for something special for your loved ones. Favorite resale shops: CCA (Christian Community Action) in Lewisville and The Colony and Frisco Resale, obviously in Frisco. Judge a book by it’s cover. With all of the used bookstores around, and to use a car dealer term, why not buy some pre-owned books? There are many great reasons to do this. First, you can write a special note in it for the person you’re giving it to. (Unless you’re buying a book for Jerod Chambers, then you need to write on all of the pages in the book, as he loves that!) Second, with the the endless number of topics and abundant, ingenious styles, it’s easy to find a book for any person on your list. But my favorite part of giving books as gifts? Altering them. That’s right, altering them. 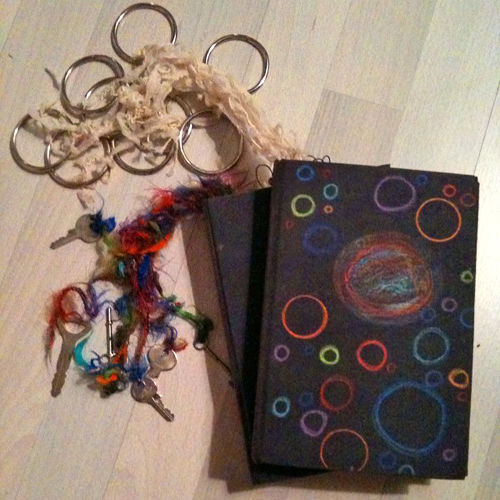 Write notes, scribble, paint, tape things, glue cutouts, add bookmark strings… the list goes on. There’s two ways to do this, make a book into a completely new books by gluing pages together and adding your own embellishments, like the vintage books pictured here. The other idea is much simpler, just add your own stuff to the book on the blank pages, creating a personalized copy of whatever book you’re giving. Either way, I doubt this gift will end up in a thrift store. Oh, what a dilemma, which idea should you choose? At the risk of offending anyone who’s done this, I just have to say, this has brought a whole new level of ridiculousness to gift giving. I have to add this to Jody’s list, but as a ‘don’t do it’. What is it? 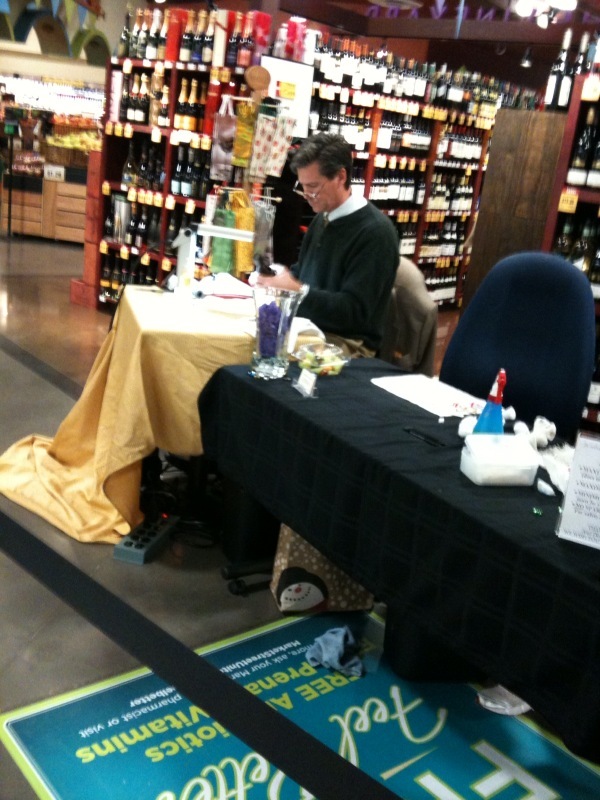 Personalized wine bottle etching, the gift that keeps on… recycling? So let’s suppose you get one of these treasured heirlooms, and instead of keeping it in a rack, you actually want to drink it. Hmm, now you’ll have an empty bottle that will look really nice, if you just happen to love empty wine bottles all over your house. Great, just what I need, a guilt trip if I throw this bottle away after enjoying it, as it was intended. Or maybe I should keep it, and I’ll set it on the counter when you come to visit. No, this bottle will be a wonderful addition to my recycling bin. Look, I’m all about the free stuff. The engraving is free at Market Street if you buy a bottle of wine over $10. I have to ask, what is the engraving guy thinking? He didn’t look all that happy to be doing this, or he might just have been in his engraving ‘zone’. Do your friends really need a name on their bottle of wine to know it belongs to them? If you’re not sure, look inside their coat and see if their name is written on the tag with a Sharpie. I was at a party last night, one where the white elephant gift exchange was the football half-time event. Cool! Because I’m all about finding an unusual gift. The gift I walked away with last night was a good one. It was someone giving me two hours of their time for whatever I might need it for. This got me thinking. 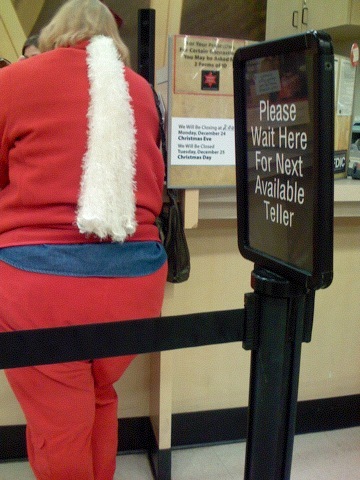 This Christmas I’m trying to live differently, giving my time and money to people in need. Let me just say that I am giving money, but I don’t have a lot to give. I’m also giving my time, and even though there’s not a lot of that either, I have more time than money. What are your resources and how can you use them to help people? My kids and I chose to sponsor Casa Hogar Elim and The Sons of Lwala this year, financially and with an allotment of our time. What would your friends think if you did this in their name as a gift? My experience? It inspires other to do the same thing. Give to someone that can’t give back this Christmas. Set an example of giving goodness for others to follow. I was sad yesterday afternoon as I watched the large group of people leaving for Mexico. I so very much wanted to go with them. They are bringing Christmas gifts to the children at Casa Hogar Elim, an annual thing started last year by Jeff Harrell. 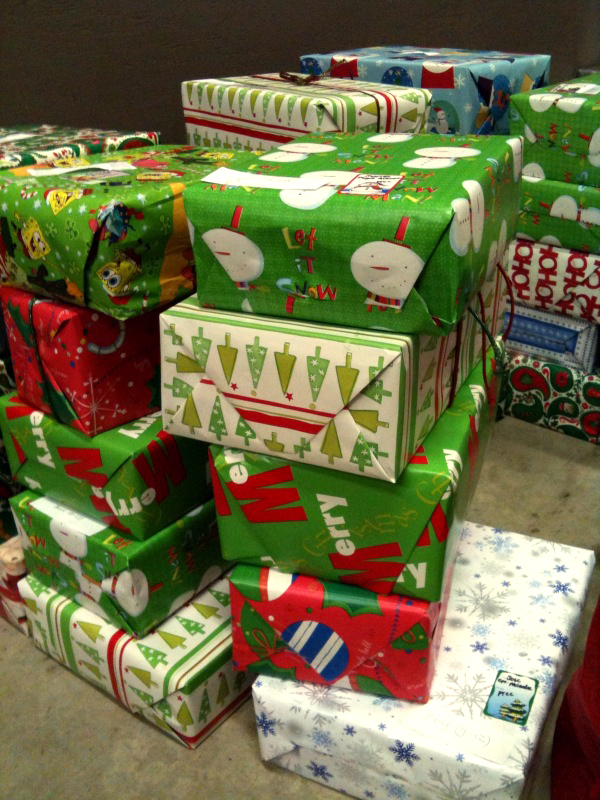 We collect shoe boxes, fill them up with small age-appropriate toys and sugar-free candy, then wrap them up. Now these gifts aren’t just for a boy, age 6, or a girl, age 10, there’s a package for each individual child with their name on it. We can’t put bows on these boxes, as they would be crushed under the weight of all the supplies in the cars and vans. There are so many people from our church that want to go to Casa Hogar, they don’t even need to advertise the trips. If you’ve been there, you’re a walking billboard for CHE. The Thanksgiving trip even had a waiting list this year. The ‘regulars’ have gone so many times, they can’t even tell you how many trips they’ve made. 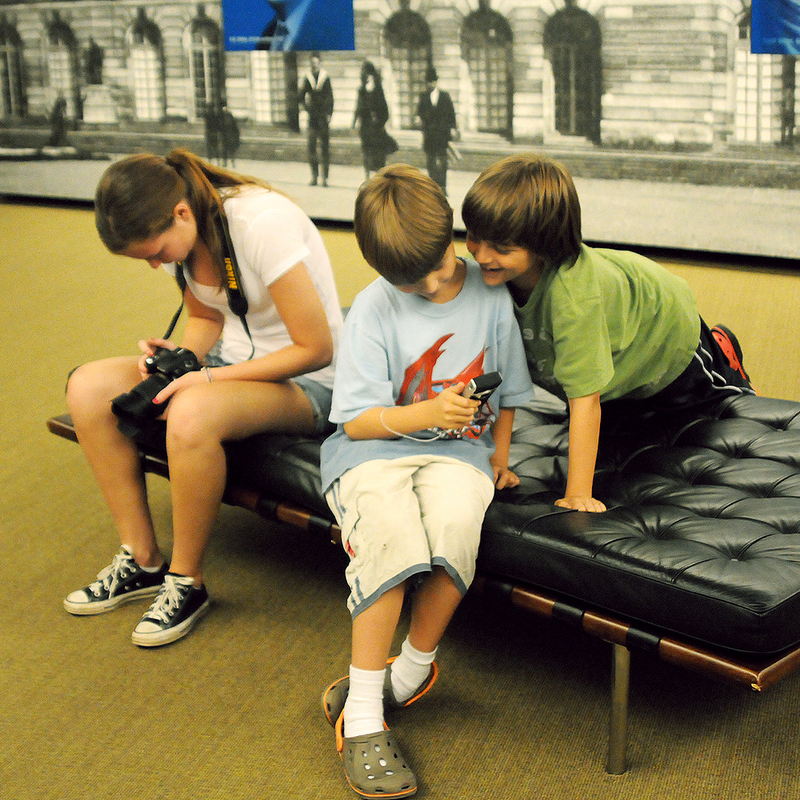 We love these kids, and for those of us whom visit often, these kids are our extended family. You know the old saying, ‘you can choose your friends, but you can’t choose your family?’ I beg to differ. I was thinking last night about family and friends, and all of the funny ways God placed them in my life. God clearly has a sense of humor! I moved into my house three years ago, although my kids didn’t start attending the local school until two years ago. We live at the end of the street, walking distance from the elementary school. 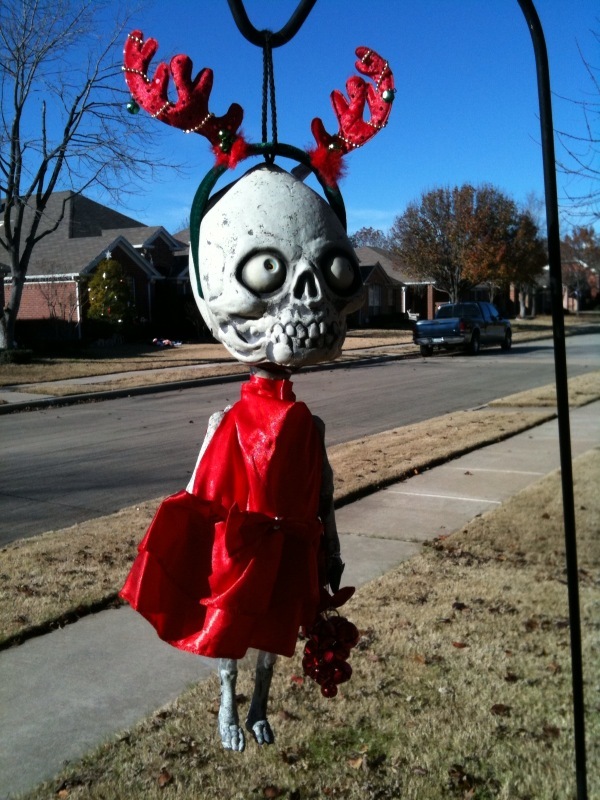 I noticed a house that had some fun yard decor, more specifically, ‘little skeleton girl’. She was out for Halloween, dressed in her hippie costume, but she stayed out for other holidays. What!? Could this be? Could I really have a soul sister on my street? I was intrigued. Why did I think this was my soul sister? I have a full size mannequin named Darla. You can learn more about her on Facebook at facebook.com/luvplasticpeople. Anyway, I wanted to meet little skeleton girl’s mom. I did, and her name is Patty. Patty loves to volunteer her time for great causes, so we cross paths quite a bit, not only walking down the street, but many other places. Patty was at Victoria Gardens with me when I met Flo, the ghost of Christmas future. I can’t wait to go to Casa Hogar with Patty! I live in a great neighborhood, as it’s filled with fun, caring people like Patty. As I said in yesterday’s post, I was an only child until my teen years. I really don’t remember ever bugging my parents about wanting a baby brother or sister. I don’t know if that’s because I didn’t want one or because I knew it was a horrible idea for my parents to have anymore children. I guess God knew I needed some siblings, but decided to bring them in under different circumstances. At the age of 14, I got a step brother, two step sisters, and soon after, a half brother. The funny thing about this is my sister Jo. We are not blood related at all, yet we are just alike. Our beliefs, our personalities, our creativity… and the list goes on. The more perplexing thing here is our kids. My son Joe and her son Isaac, again, no genetic relation, not only look alike, but act alike. Jo lives in Wisconsin, so we don’t get to see each other too often. 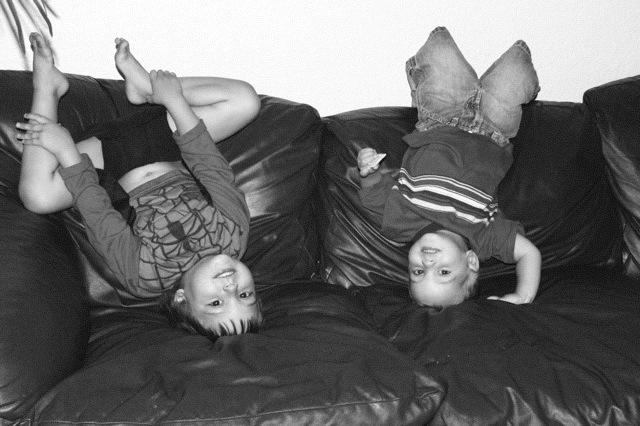 We were on vacation in Florida several years ago, Joe and Isaac both ‘sitting’ on their heads on the sofa watching TV. Jo says, “Look, Isaac taught Joe to do that.” I replied, “What? Joe’s been doing that for months.” Both kids had been doing this separately for months. And just for the record, they look alike right-side up too. This next one isn’t as much humor funny as it is implausible funny. Let me just start by saying it’s an extremely rare occasion when I can find anything good to say about my ex-husband. The aftermath of an interaction with him frequently results in misery and relational mass destruction. Dawn and Genna live near Kansas City, so we don’t get to see them very often. Genna is my step-daughter and Dawn is her mother. The boys and I took our family vacation up there this past summer and we had a blast! Okay, I know what you’re thinking. You probably think it’s odd that we’re friends, so this next statement will really throw you. We consider ourselves family. Yes, family. You may not be able to choose your genetic family, but through love and friendship, you do choose your ‘preferred’ family. One of the definitions of family is “a group of people who are generally not blood relations but who share common attitudes, interests, or goals…” Yes, that’s us. I’ve realized one thing this Christmas, one very big positive thing to say about the boys dad. Without him, I would not have my boys, nor would I have Dawn and Genna. As you can tell by the photo, they are obviously ‘related’, as they are a bunch of little camera junkies! Genna is a very talented photographer and is doing an internship right now. The boys like to make funny YouTube videos, a couple that have gone small-time viral. God has brought many other people into my life in unexpected ways, from church and Facebook to a lady at church who accidentally door dinged my beat-up car. I’ll take 100 of those kind of door dings! Oh, wait, I have 100 door dings, but only one has a great story behind it. Yesterday I was pondering my favorite Bible verse, Romans 12:2. It’s so applicable to the Christmas consumerism and might just be another clue in finding the Christmas spirit. Here is the verse in two popular translations. NIV – Don’t copy the behavior and customs of this world, but let God transform you into a new person by changing the way you think. Then you will learn to know God’s will for you, which is good and pleasing and perfect. The Message – Don’t become so well-adjusted to your culture that you fit into it without even thinking. Instead, fix your attention on God. You’ll be changed from the inside out. Readily recognize what he wants from you, and quickly respond to it. Unlike the culture around you, always dragging you down to its level of immaturity, God brings the best out of you, develops well-formed maturity in you. This one short verse floods my mind with vivid images, many of them exist as photo light paintings in a collection I’ve entitled “excessable”. 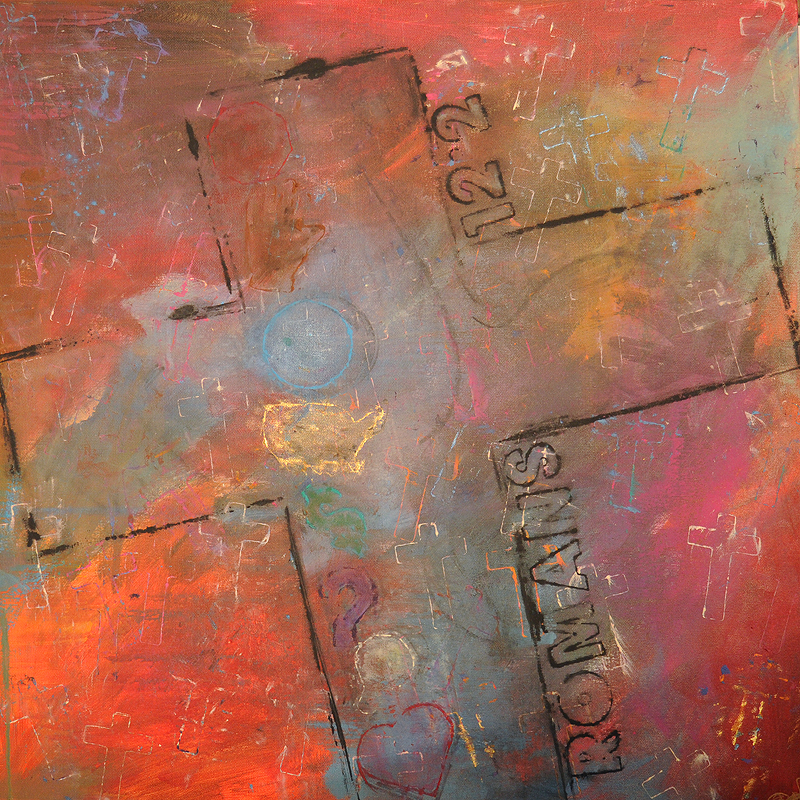 I was also inspired to paint this abstract rendition of Romans 12:2 earlier this year. The details on this canvas were painted with cookie cutters and guitar strings. I always start painting with brushes, but end up painting with my hands and three dimensional objects. I guess I do that because I like the feel of the paint and the energy that goes into the painting by touching it. I also like finding objects that produce intriguing impressions, creating a visual adventure on the canvas. You can often find the ‘hidden’ eye candy in my art pieces if you look long enough. The cookie cutters symbolize our current culture and represents the expectation placed on us to conform to our society. The guitar strings could represent the ‘strings attached’ to us, but truth be told, I just love painting with them. This painting was auctioned off last month to raise money for the Sons of Lwala benefit. I’m thinking about Romans 12:2 lately because I desperately want Christmas to be different this year. Does anyone realize that we’ve all been sucked into this vortex of materialism, buying things because we feel we have to, not because we want to? If it’s the thought that counts, what does this say about how we feel and what we think of people? The more I take notice of my surroundings, the more I see a contrast of rich and poor. Also of good and evil. However, I also see that people are slowly coming over from the dark side, doing random acts of kindness and serving mankind in very creative ways. We have the ‘tinselectomy’ thing going on at the church and they’ve asked people to blog stories of helping others or stories of something nice that was done for them. The problem is, this can’t be done anonymously, so most choose not to share their experiences. They don’t want to be boastful or prideful about it, but we need to find a way to get their stories out there as an inspiration for others. In talking to people and simply paying attention in my day to day activities, I’m witnessing so many stories! People are doing wonderful things for their friends and for people they don’t even know. I’m going to share some of these stories without using names. There are so many, and I’ve tried to update my journal frequently to record all of them, but I know I’ve missed some. I’ll just share a few of them. The most recent story happened yesterday. My friend called me to see if I needed anything, as I had a sick child at home. I needed some Sprite and crackers for him, but I did not want to take him out of the house. She brought everything he needed and also something for me. All of my neighbor’s, together, picked up my other child from school and brought him home. This friend that brought the supplies, whom has been out of work for several months, has a job interview in a couple of days. To understand this situation a little better, her husband has also been unemployed. She mentioned her coat being in hock at the dry cleaners. She needed to get it out, but didn’t really have the money to do so. Another friend overheard this, went to the dry cleaners, picked up her coat and brought it to her. She didn’t get the coat right away, because she and several others were out serving lunches they had made for the day laborers, the guys standing in the cold, waiting for any paying job they can get their hands on. These men sometimes don’t eat for a couple of days at a time. We plan to make this an ongoing ministry once the Christmas season passes. Knowing these men are standing in the cold, another guy I know, but not very well, bought a bunch of coats to give to homeless or impoverished people. We have experienced some incredibly cold temperatures and I’m sure those coats are going to be much appreciated. Many of these men have families they are trying to support. Our church sponsored a party for the kids last week giving them some toys and an opportunity to talk to Santa. Another friend, knowing many of these families don’t have cars, not only tried to arrange transportation, but she gave rides to anyone needing it. I could go on writing stories all day, spanning from friends collecting money to buy a shower chair for a special needs orphan to paying for a person in line behind them at a restaurant. Although these people have chosen to remain anonymous, their hearts are in the right place. Are they experiencing the Christmas spirit? Do you want to participate? There are plenty of ideas available on the internet, or just try this simple exercise. Look closely around you, through the lens of kindness and mercy, and you will see things you’ve never seen before. Your mind will be transformed, as will your heart. Also, if I peaked your curiosity earlier on the ‘excessable’ collection, here are some of the images. Not really Christmas related… or are they? Bright and early yesterday morning, I got a glimpse into a new world, one I had not experienced before. The new world? Wrestling. My son has been doing this for a couple of months now, but this was the first time I had the opportunity to take him to a tournament. The night before, we drove across town to get him weighed in. They weighed him and inspected him, in a very non-personal manner, writing on him with a Sharpie every time something was determined. If I was nine years old I would want to wrestle too, just so I could have the marker art all over me. When the process was complete, the coach said, “You can go over there and see what bracket he’s in and you can buy your brackets for tomorrow.” I smiled and said, “thank you.” Buy what?! Surely I didn’t hear that correctly. He said they might change before tomorrow, so I figured we would just do the bracket thing tomorrow, whatever that was. We arrived 30 minutes early the next morning. There were people everywhere, I couldn’t even find a parking spot. I parked on the grass with a few other cars that were also on the late side of early. We walked in and I had no idea where my child was supposed to go. The ‘brackets’ on the wall are in a special, secret code that everyone else understood but me. Where are the decoder rings? 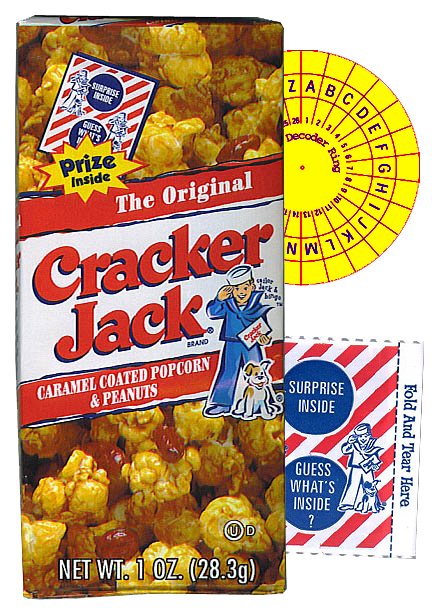 I never found one in my Cracker Jack box. There were no less than 30 sheets of paper taped to the wall with lines and fine print. Where is Carla Moss when you need her? She probably wouldn’t even need a decoder ring. Joe found his coach and we finally got tot the right place. Joe was on mat 8, match 4, so we had a little time to find a seat and wait for the tournament to begin. Let me just say that I don’t get organized exercise. Sitting there, I had a flashback to third grade kickball. I wanted desperately to play, but I didn’t understand the game. Back then, I suppose they thought all kids should know how to play that game, but I had not learned that at my last school, nor from my parents. One day, I finally got to the front of line. It was my turn to kick the ball and have people cheering me on to accomplish running around in a circle before the ball could catch up with me. Here comes the ball… kick! I kicked, I ran and the cheering began, only it wasn’t cheering, it was people yelling at me because I ran the wrong way. Now I’ve heard about these crazy parents at sporting events, but this was my first time experiencing them. The word ‘wow’ came to mind. The parents were giving their kids advice, telling them what to do and what not to do. Some were practicing moves, one guy even had his kid standing on his head to practice balance. Hmm, maybe that’s how we’re supposed to achieve balance in our lives, let’s all stand on our heads. Studying these intense parents, I had to wonder if I’m a sucky parent because I just want my kids to enjoy what they do, support them and cheer for them without trying to make them into competitive animals. We had to wait a long time in between matches, kids and parents pulling out their electronic pacifiers to deal with the boredom. It was almost Joe’s turn again, but first ‘Hoss’ was up. I won’t even get started on that. His parents were right in front of me, yelling at him, shouting loudly at him, all of the moves he’s supposed to do and not do. It seemed to me like Hoss was struggling to do his best, distracted by his obtrusive, pushy parents, attempting to listen to his coach and sporting a look of confusion and defeat. At the end of this particular match, his mom looked over to his dad, as she had no idea what just happened. Did he win or lose? She was as clueless as I was. Yes, that was a long-winded story and I know you’re asking, “What does any of this have to do with Christmas?” It has a lot to do with Christmas. Christmas chaos. The chaotic vision of people all over the place, running around trying to accomplish a win, not unlike what you would see at the mall at Christmas time. Our competitive nature has spilled over into Christmas. Shopping has become a marathon, it’s even advertised that way. Christmas decor has become a production, not just a simple display of our love of the season. Who can buy the most gifts, put the most lights on their house and attend the most parties in less than 30 days, assuming they didn’t start before Black Friday? The bigger problem here is that nobody seems to be enjoying it. Sporting events used to be about supporting your team, now kids are playing portable video games and parents are playing with their mobile phones, distractions from the real meaning of the event. Looking at the Facebook news feed, I see a lot of comments about having to shop and finally getting the tree up. These types of comments do not have a happy tone. The mood is unfortunate. The drudgery of shopping for people that are on the ‘I have to buy for’ list. The torture of trying to find the perfect gift or top last years perfect gift. Having to attend the company ‘holiday’ party. Tolerating the extended family. Suffering through the repetitive motions of the season. I also had to buy a ‘bracket’. Really, they can’t provide a meaningful 3¢ piece of paper to the coaches? Every ounce of my being did not want to make that purchase, however I did not have a choice. Do we buy gifts because it’s the socially acceptable thing to do and we feel there is no choice? Sadly, I believe the answer is yes. This year, our gifts will be thoughtful and meaningful, as I’m choosing to ditch the social ‘I have to buy’ expectation. My kids and I are giving money to many worthy charitable causes in the name of all the people we are expected to buy gifts for this Christmas. And what did Hoss learn yesterday? Did he walk away yesterday feeling loved and supported or feeling like a failure because he didn’t accomplish the mission set before him? Is he wrestling because he enjoys it or because he’s trying to appease his parents? Are we celebrating Christmas for the right reasons? Once Christmas day arrives, what have we achieved? More stuff, less joy and in most cases, a lot of debt. Are we any closer to Christ? I hope I can feel the Christmas spirit on Christmas day, without my decoder ring. I have some good ideas about how to feel the Christmas spirit, but yesterday’s experience has moved me a little bit away from it. This morning, I have to sadly report that the Christmas season is getting busier and doesn’t show signs of slowing down. My blog is named ’embrace chaos’, because I do just that. I’m not good at relaxing, slowing down or experiencing any type of leisurely lifestyle, although I do have some deep down desire to do just that. In trying to evaluate my schedule and why it feels so hectic, I did realize a few things this Christmas season. One thing is that there’s more to do during Christmas, but the rest of the busyness and regular weekly tasks don’t go away or change to accommodate this reality. Due to the commercialism of Christmas, most people are not only busier in their personal lives, but also at work. I work for a church, and although it isn’t busier for the same reason, there’s still a lot on my plate. I’ve come to the conclusion that everything on my plate is attached to bungee cords. The tasks might be accomplished, but they eventually come back, and with much more force the time second time around. So as much as I would love to blog all of my many thoughts on this topic, I simply don’t have the time. I have to get the kids up, drive across town for Joe’s wrestling, go to work and finish my weekend stuff before the 2 o’clock rehearsal, finish making our ‘tinselectomy’ Christmas gifts, finish two freelance jobs, start another one… okay, you get the point. Take the time this year to evaluate your hectic Christmas season. Although I’m too busy, I’ve started the evaluation process and I’m looking for innovative changes to create the magic word we all crave: BALANCE. As we were driving home last, I thought about our house being one of the few without Christmas lights. I had every intention of putting lights up, but we still haven’t. I have a few strands of lights on the garage, however it would look like I had a few random strands unless I got really creative with them. Last year I wanted to use flamingos as reindeer and a lawn chair for a sleigh. I posted on Facebook that I was looking for flamingos. Amy Nemeczky bought me a cool ceramic one, and we fondly named him Chris. 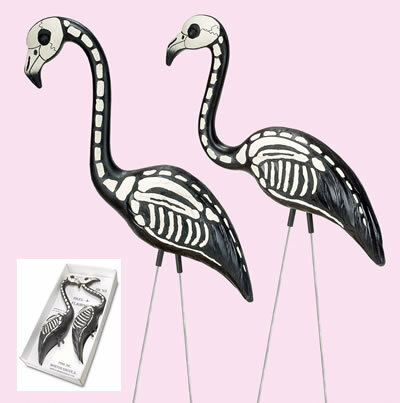 Thad also bought me a whole flock of plastic flamingos and two skelemingos. Since they arrived right before Christmas, I never got a chance to carry out my plan, not that my neighbors would have thought anything out of the ordinary had I created this landscape scenerio after Christmas. 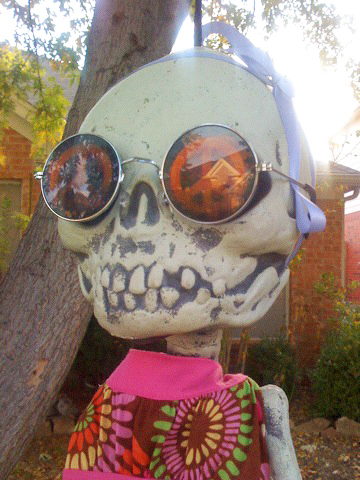 Oh, and the photo of Skelly is him on vacation with me and the boys. That was a rabbit trail, hey? I’m also one of the few houses in Frisco with mature trees. When we had that crazy snow flurry about a week ago, all of the yards were covered with the untouched white snow, all but one, our house. The enchanted forest in my front yard has a beautiful canopy of trees covering every square inch, protecting my yard from the portrayal of winter. I did have the trees trimmed, so if we did add lights to the house, you would be able to see a lot of them. So why haven’t I put lights up? It just hasn’t been a top priority, or any priority for that matter. Since starting the 25 days of Christmas blog, yesterday was the first day I had the feeling of being too busy. My Christmas and work to do lists are long, but all of the items on them are very important. Shopping is not on the list. The tiny amount I had to do has been done for weeks. At least this year busyness is an improved kind over last year. It’s about helping others, letting our friends and family know that we appreciate them and not participating in the consumerism. The lights may not be a priority, but carrying on a tradition my boys and I started last year was of great importance. We did our annual ‘boo’ last night. Now I know what you’re thinking. If you live around here, you know that booing someone is a Halloween thing. If you don’t live around here, Texas has a lot of things that don’t make any sense to people outside of this big star-shaped land mass. We made our candy boo bags a week ago, finished assembling them last night and attached our mysterious Christmas gift in a tiny envelope taped to the front. Nope, I’m not telling you what that is yet. We made our hot chocolate with more marshmallows than chocolate, loaded up our gear and took off in our very old Infiniti sleigh. We spent two hours driving all over Frisco until we ran out of bags. We’ll have to make a lot more of these next year. I drove the sleigh, pulled up in front of the target house and turned off the lights. Next, the boys took turns, dropping a bag by the front door, ringing the doorbell and running to the car quickly so we could drive off before being caught. And those of you with babies, we knocked instead of using the doorbell, as to not wake them. We aren’t as experienced as Santa, or we would have just come quietly down the chimney. Now ‘boos’ are supposed to be anonymous, and last year we were, yet somehow people knew who it was. Go figure. This year these little bags have some mystery, but ultimately our friends can go online and see what we are up to, because we are always up to something. This Christmas I am trying to plan things ahead of time and get things done early. When my ADHD and OCD collide, that usually means that events happen spontaneously, but everything is more than prepared and ready for it. Sometimes doing things last minute is the motivation I need, so it works for me. It seems to stress other out to the point that they won’t make eye contact with me, in hopes that I won’t ask them to be involved. The funny thing about it? I apparently do this to others, as I did it yesterday in a staff meeting. Just for the record, it didn’t work, I have to make a bunch of vinyl signs for Christmas Eve. I suppose what I experienced yesterday is that busyness, no matter if it’s good or bad, takes away from the Christmas spirit. 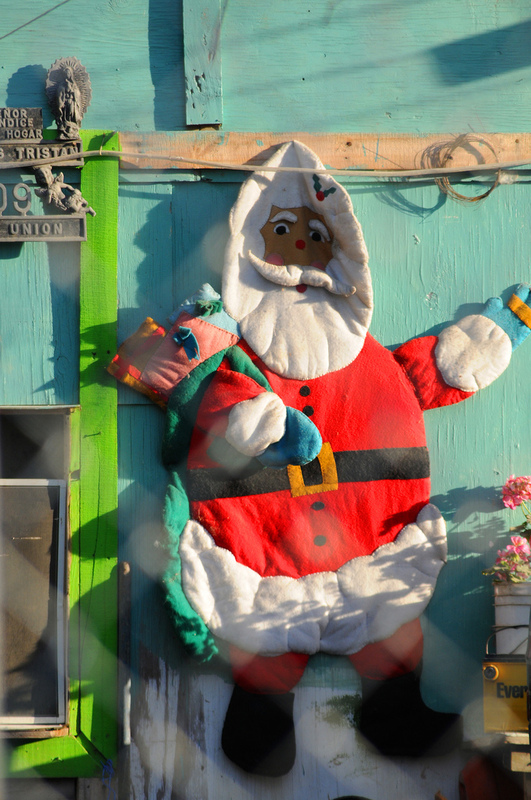 Is slowing down to experience the joy of the season really possible? 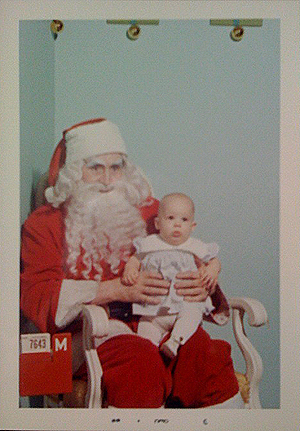 Okay, it’s time to share a few more ‘Santa shoot’ photos. See if you can recognize the light scenarios.